Do you know how to factory reset an iPhone/iPad the easy way? As is know to many iPhone/iPad users, there are 2 common ways to make it. One of the 2 ways requires that you connect your iOS device to the iTunes and it is a bit difficult to perform. As a result, I will teach you how to factory reset an iPhone/iPad without iTunes with ease. What is to be done before doing the factory resetting process? Factory reset an iPhone/iPad means that you will erase all the data on your device such as messages, contacts, photos, notes, apps and so on. So before doing that, remind yourself to backup the important data. Another instruction is to make sure that your iPhone/iPad has enough battery. After that then you can proceed to perform the resetting process. How to Factory Reset an iPhone/iPad without iTunes the Easiest Way? Step 2: Tap the General category in Settings, then scroll down and tap Reset. Step 3: Tap Erase All Content and Settings and enter your PIN when prompted. In this step many people may come across a new problem “how to factory reset iPad without a pass-code”. In this case you can use iPhone Care Pro to unlock it and then go on with the next step. Step 4: Then a warning pops up in the bottom to remind you to make sure the resetting process. Just choose Erase iPhone/iPad to continue. After a few minutes, you will supposed to succeed to factory reset the iPhone/iPad. Once the process is done, you will get a brand-new iPhone/iPad. If you want to recover some of the data on the iPhone/iPad you can restore them from iTunes backup or a third-party data recovery tool like iPhone Data Recovery. Always the iTunes backup files is password-protected. If you can’t remember it you can resort to iPhone Backup Unlocker (http://www.tenorshare.com/products/iphone-backup-unlocker.html) to recover it. Facebook’s policy to force users to install a separate Messenger app (which has a 1-star rating in the App Store) on their smartphones hasn’t been popular. However, there is a quick way for iPhone users to stop Facebook installing Messenger and continue chatting using the normal Facebook app. All iPhone users have to do avoid this unpopular decision is to hit the install Messenger button when prompted by the standard Facebook app, but switch to the App Store while the Messenger app is being installed and stop the installation or delete the app. When you pause the download in App Store, then return to Facebook, the old messaging interface will return. You can even give Messenger a test drive and delete it if you don’t like it. After that, Facebook won’t pester you to download the new app again. With this done, you can feel free to use other message apps on iPhone. 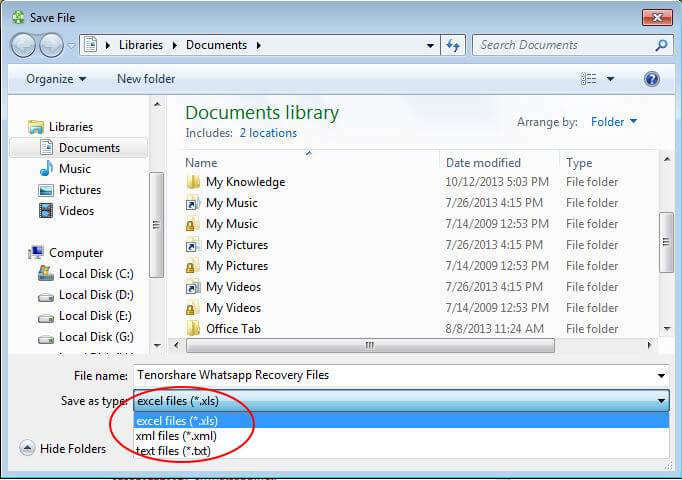 If you happen to have WhatsApp installed, I’d like to share with you an easy way to back up WhatsApp messages with a freeware called Free WhatsApp Recovery. 1. 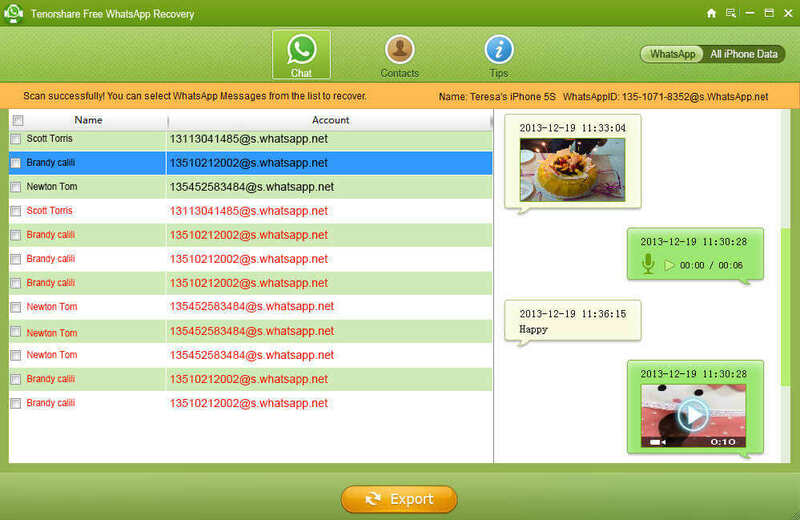 Launch Free WhatsApp Recovery on your computer and connect your iPhone with this computer as well. Note: No need to connect iPhone to computer if you are to extract the iTunes backup. You should select the iTunes backup file instead. 2. In a few minutes, all the conversations will be displayed on the main interface. Choose the conversations you wish to export. To select a conversation, tick the checkbox next to each message thread on the left. Or check the “Messages” box on top to select all messages. 3. Click on the “Export selected” button. Pick a location on the PC where to save the messages. More info about WhatsApp can be found in the Top 10 WhatsApp Tips and Tricks. Just updated to iOS 7 on your iPhone 5, iPhone 4S, iPad 4 or other older iOS devices? Stuck with current devices, which are acting a bit sluggish after upgrading to iOS 7? Good news is that there are a few things you can do to improve an old iOS device’s performance somewhat. Deleting unnecessary apps could help you save a lot of space on iPhone, iPad or iPod. If your device’s hard drive is near capacity, reducing the amount of data stored on it could result in a speed boost. You can check how much free space you have, go to Settings > General > Usage. We’d suggest keeping at least 1GB free just to make sure there’s some free space for iOS to shunt files around without having to do too much juggling. To delete an app, find it, tap and hold until it starts wiggling, and tap the X in the upper-left corner. Also, you can delete unwanted photos which takes up a large number of space on iDevices. If you accidently deleted the wrong photos, use iTunes Data Recovery to restore the deleted photos. iOS 7 runs more processes in the background to make it more convenient to use. For starters, apps now update by themselves in the background, which saves you the trouble of updating your apps manually. Turn off Automatic Updates: Tap Settings > iTunes & App Store > and turn Updates off. If you spend a lot of time uploading Music, Apps and Books you might want to turn off those as well. Turn off Background App Refresh: Tap Settings > General > Background App Refresh. Turn Background App Refresh off and tap Disable Background App Refresh. iOS 7 introduced new animations, which quickly lose their luster when they result in a choppy motions and lag. you can turn them down if this setting is available your device. For instance, iPad 2 supports this motion effect but iPhone 4S doesn’t. Turn off Motion: Tap on Settings > General > Accessibility > Reduce Motion and set Reduce Motion to On. This turns off the parallax effect of icons and alerts (many people find it easier to use in this setting). Tired of having the same ringtones with other iPhone users? Want to have different and recognizable ringtones for calls and messages on your iPhone? This article describes how to record a voice memo and use it as your ringtone. When you finish with the recording, you should prepare a computer which works fine. You could change the file extension for the recording so that it can be used as a ringtone. As the Voice Memo recordings are captured and saved as “.m4a” file format, you need to rename the file extension to a “m4r” file which can be used for ringtone on iPhone. Finally you will need to go back to your iPhone and set the voice recording as your ringtone or text messages tone. Those who have already set ringtones or individual text tones before must be very familiar with the steps below. Under “Ringtones” find the newly transferred ringtone. The default name is “Memo” if you didn’t rename it. Just select it and tap “Save”. With all this done, you can now enjoy your special ringtone now. In addition, if you just mistakenly deleted important voice memos from your iPhone, you can try to use iPhone Data Recovery to recover the voice memos.